Review by AllTheBestFights.com: 2018-09-21, pretty good finish but the rest of the fight was not so exciting: Rafael Lovato Jr vs John Salter gets two stars. The undefeated black belt in Bjj and former world jiu jitsu champion Rafael Lovato Jr entered this fight with a perfect mma record of 8-0-0 (87% finishing rate) and he is ranked as the No.38 middleweight in the world. In his last three bouts he has won over Mike Rhodes, Chris Honeycutt (Chris Honeycutt vs Rafael Lovato Jr) and Gerald Harris (Rafael Lovato Jr vs Gerald Harris). His opponent, the black belt in Brazilian jiu-jitsu John Salter, has a record of 15-3-0 (100% finishing rate) and he entered as the No.31 in the same weight class. He suffered his last defeat when he faced Reggie Pena in 2012, since then he has won seven bouts beating Kendall Grove and Jason Radcliffe in 2017 (John Salter vs Kendall Grove). 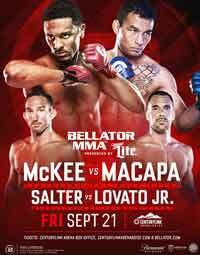 Lovato vs Salter is on the undercard of AJ McKee vs John Teixeira da Conceicao – Bellator 205. Watch the video and rate this fight!